The resource-constrained project scheduling problem (RCPSP) is the basic problem type in project scheduling and aims at the minimization of the total project duration. It is one of the most widely studied project scheduling problem in literature, and it has resulted in an overwhelming amount of papers with solution procedures to solve the problem. In the RCPSP research community, a lot a comparisons have been made, mostly done on the PSPLIB data instances generated by ProGen. In our paper published in Operations Research in 2007, we have used a new set RG300 created by RanGen which can be downloaded here. Resource-constrained project scheduling is integrated with Schedule Risk Analysis (SRA) assess the schedule sensitivity and Earned Value Management (EVM) to control projects in our software tool ProTrack that can be used in educational and business settings. Visit the ProTrack website here. The Resource Availability Cost Problem, abbreviated as the RACP, that aims at determining the optimal level of resource availability at a minimal cost. When you teach a Project Management course, resource-constrained project scheduling is probably on of the topics you discuss. 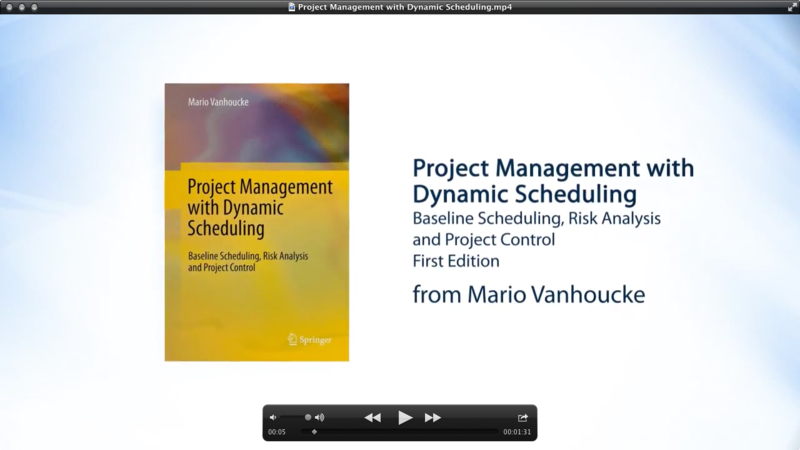 In the book "Project Management with Dynamic Scheduling: Baseline Scheduling, Risk Analysis and Project Control", an overview is given of Project Management, including the RCPSP and its extensions, and possibilities to solve case studies by ProTrack that is freely available to students. Debels, D. and Vanhoucke, M., 2005, “A Bi-population Based Genetic Algorithm for the Resource-Constrained Project Scheduling Problem”, Lecture Notes in Computer Science, 3483, 378-387. Debels, D., De Reyck, B., Leus, R. and Vanhoucke, M., 2006, “A hybrid scatter search/electromagnetism meta-heuristic for project scheduling”, European Journal of Operational Research, 169, 638-653. Debels, D. and Vanhoucke, M., 2006, “The Electromagnetism Meta-heuristic Applied to the Resource-Constrained Project Scheduling Problem”, Lecture Notes in computer Science, 3871, 259-270. Debels, D. and Vanhoucke, M., 2007, “A decomposition-based genetic algorithm for the resource-constrained project scheduling problem”, Operations Research, 55, 457-469. Read the full list of publications here.